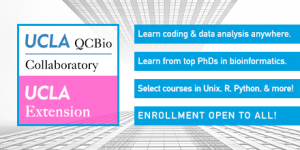 The Institute for Quantitative and Computational Biology (QCB) is excited to announce a new partnership between the QCB Collaboratory and UCLA Extension. For over five years, our interactive coding and data analysis workshops have gained popularity with UCLA-affiliated life science and medical researchers who are learning basic concepts or expanding skills in computational data analysis. Now, for the first time, individuals outside of the UCLA community are welcome to enroll in our popular QCB Collaboratory workshops. Course sections taught via UCLA Extension are online through the WebEx platform. Online sections are fully interactive and hosted by a dedicated instructor. Please select the “Enroll as a Non-UCLA Affiliate” option on the course webpage.